Image from a Frith Postcard courtesy of Ken Johnson; also thanks to Robin, Jenny Taylor, Katharine, Jean Siddle, Amanda Stobbs, Jon Waters and Callum Duff for the updates. Information on the school came from ”Paul Chrystal & Simon Cross – Redcar, Marske & Saltburn Through Time”. The Towers was a girls’ boarding school. My mother was a pupil there, not sure of her exact dates of attending but approximately 1935-1937, she subsequently attended the Polam School in Darlington. Her home was in Egypt, but her parents were from South Shields. I believe the school operated from the late nineteenth century until the mid twentieth century. 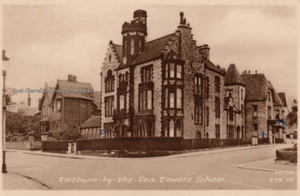 Do a Google search for towers school saltburn and a very interesting album of photos can be found. I believe the school occupied the building illustrated here and several surrounding buildings. Yes, my mother attended there too, from about 1924 to 1928. I have a picture of her in her school uniform if you would like it. They used to play hockey on the beach. I have just returned from a visit, my mother would have been 100 today if she had lived. I was a day girl at The Towers for a short period from early 1940 until mid 1942. My mother’s younger sister who was only 9 years older than me, was a boarder from the mid 1930’s. In later years, we often spoke of our time there – not the happiest! The owner/headmistress at that time was a Miss Pybus who may have followed Edith Haycraft. Miss Pybus lived in the house to the left of the photo. Wartime food was rather horrid – cochineal coloured tapioca pudding & tripe seem to have featured on a regular basis. I was pupil at school until 1939 when it was evacuated to rusland hall in the lake district. we were there when the german prisoner at grisedale escaped and the mounted police clattered onto our courtyard.They made a film of the escape. I left in 1940 and would like to know when the school ceased to exist. Jean. I’m amazed to find this page, as I was a student at the Towers, when I was eight years old. Now, I’ll have to see if I can find the album of photos mentioned by Ms. Hutchinson in her post. I attended the Towers in 1953/54, and then we returned to the United States. My mother, Jose Mawson, was a pupil at the Towers from 1937 to 1941, and was there when the school was evacuated to Rusland Hall in 1940. She remembers that the Headmistress, Miss Pybus, had a little white dog called Zeppi, and that all the boarders used to be invited round to Miss Pybus’s house (next door to the Towers) on a Sunday, where they were each given a “Dainty Dinah” toffee! After the War started, but before the school was evacuated, the boarders used to be taken into the vaults of the Zetland Hotel to shelter when the air-raid sirens sounded. She also remembers having “midnight feasts”, but with food in short supply thanks to the war, they used to eat toothpaste!! Her great friend was Patricia Burn; other friends were Elizabeth Leathly-Shaw, Hilary Toy, Anne Clinkard, Heather Dorman, Pamela Radge, Marie Locke, Rosetta Bolton, and Joan and Pam Howell – whose parents were in India. After an outbreak of illness thanks to the Rusland Hall drains being unable to cope with the large numbers of people when the school was evacuated, my mother and her sister Helen left the school in 1941, and my mother subsequently attended Durham Girls’ County School. My mother, Patricia Burn, was a pupil between 1937 and 1941. She fondly remembers Jose Mawson and her fellow pupils mentioned in the post above. She has less fond memories of Zeppi the dog, who bit her! My mum has been looking through the posts and information with great interest. the “Towers” was a boarding school in the late 19th C as my Grand mother went there, she was from Helgoland. Thank you I have been trying to find something about this school. To the ECIA team: My mother was fascinated to find all this information on her old school, and thrilled to read the reply from Jon Waters. 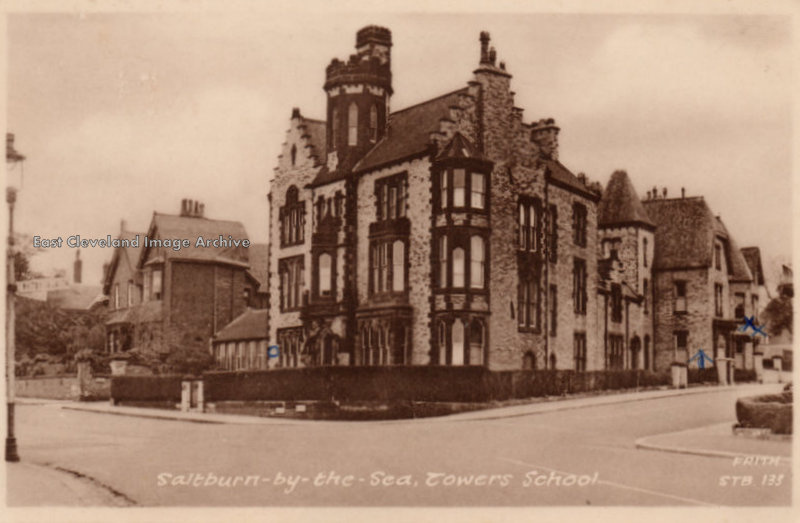 She has various photographs of her time at The Towers, both in Saltburn and at Rusland Hall. In particular there is one group-photo of 13 girls, including herself and Patricia Burn; she thinks she can name two more people, but would appreciate help with the rest. I upload the photograph here, to see if someone can come up with names for any of the others? Many thanks for your help. I was at The Towers from 1955 to 1959 and would be interested in making contact with students who were there over that period. I live in Australia. Hello, I was so surprised to find this site. I was a boarder from 1953 to 1956. I of course remember Miss Pybus!! I also remember Miss Brady our house mother, and Miss Lavender the French mistress. Friends from my time there were Jennifer Kempsey, Gillian Young, twins Roberta and Patricia Darque , Rosemary Capstaff. It would indeed be lovely to hear from anyone who remembers me. I now live in Melbourne, Australia and was interested to see this archive as my Mum, Joan Clark, taught English Literature/ History, etc at The Towers in the 50’s. We lived in Saltburn and I heard many stories of life and education there.. Amongst many chats about the school, Mum would relate how the stoical boarders would have to walk through Rifts Wood from Rushpool Hall on cold mornings; she often mentioned the Pybus sisters – I feel many students were quite in ‘awe’ of them. Mum enjoyed teaching the senior girls, but after some years a more attractive salary necessitated her move from this private girls’ school to the rough and tumble of a government junior school. However, The Towers school featured greatly and impressively in my childhood in Saltburn and Marske, a very special place to me. Pat Lowry. The Towers School closed in 1960 when it was amalgamated with The Manor School on the opposite side of the valley. The Manor School operated on a site occupied by The White House and the villa ‘Cliffden’ next door. The Manor School closed in 1969 and Cliffden was demolished and replaced by the Cliffden Court housing development. Barbara Gilbert (now Gilbert Sparks) – I was a pupil at The Towers Saltburn the year it came back to Saltburn from Rusland Hall 1945 until I think 1948. I have a twin sister Sheila Gilbert who was very ‘naughty’ and was taken away from school before she was expelled! I wonder why after the war, when it returned, no one has written in yet…what happened to them? Head Girl M. Nuttall? and Maths mistress Miss Brady. The horror of horrors! and of course, Miss Pybus. I remember hockey on the beach in that bitter cold wind. My mother-Geraldine Bailey will be 100yrs old in April and went to the Towers School Saltburn In the1930’s And I was wondering if anyone has school photos of that time as I would love to have some to show her —-or from anyone who remembers her!! or can give me an address that I might find out more about the school.